Holy moly! I can't believe this is EIC#99!!! We are having a HUGE celebration next week with AMAZING prizes! You don't want to miss it! Now, onto this week's challenge. This week's EtsyInspired shop is Becky Kazana. She makes fun wedding cake toppers, pipettes, garlands, party hats, posters and many other whimsical things. Everything is really fun and funky. I think my favorites are her fun prints of her artwork. This week's Becky Kazana is giving away three of her beautiful greeting cards as a prize. ~Make any creation you'd like and link it on the Inlinkz on the EtsyInspired blog. Please give credit to which item/s you got your inspiration from in your post! This week's sponsor is Bugaboo Stamps. They have lots of adorable digi stamps. This week, the winner will receive their choice of SEVEN digi stamps! This is my card for this week. 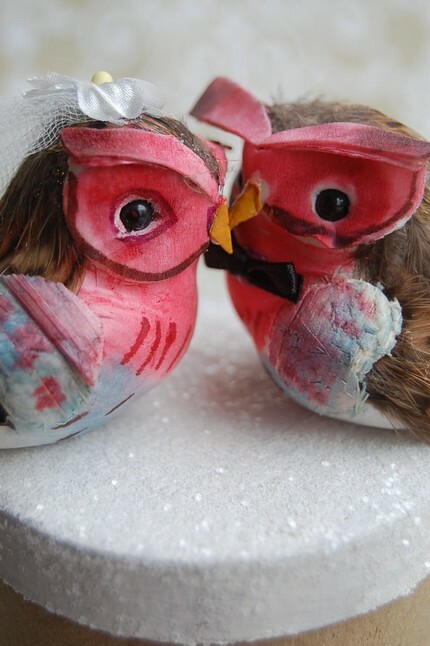 It's inspired by the bird cake topper shown above. The paper is MME Love Me Do, I just cut out the hearts and adhered them to my card. The sentiment is Unity Stamp Co. This is so cute. I can't wait to surf this shop. WOW #99! Can't believe how fast time flies. I'm planning on being at the party! love the hearts on this Ashley! Very sweet! 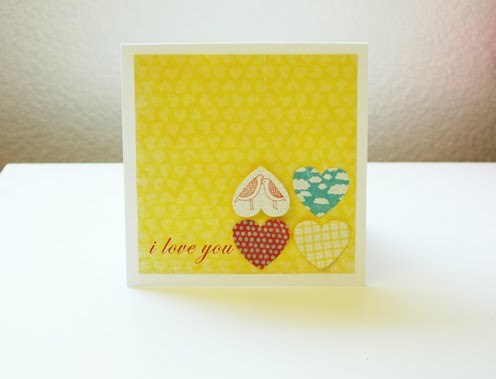 I love the bright yellow...it really makes the red sentiment stand out well. This is one fabulous CAS card, Ash! LOVE it! This is gorgeous Ashley! That DP is so pretty and those hearts are adorable! Love the upside down one too! And that sentiment is pretty! Love the card!! Such simple graphic elegance! The colors really pop! Yay for Becky! I "know" her from the etsy bloggers' team. Now I'm off to spread the word! OHHHH! I loved those birds too! I just love this card--the yellow is BEAUTIFUL and now I must try it on a card for LOVE:) LOVE LOVE LOVE visiting here:) You ROCK!! LOVELY in every way, Ashley! !